Coolant-Through Drills can be used with diverse materials. In addition to coolant-through capabilities, HY-PROÂ® CARB 3D and 5D Drill Series feature point and flute geometry that reduce thrust forces and chip size. Applied multi-layered TiAlN coating resists thermo-cracking from heat, improving wear resistance, and overall design fosters achievement of higher feeds and metal removal rates. Common DIN shank sizes promote rigidity while reducing number of tool holders required to accommodate them. OSG Tap & Die (OSG)'s HY-PRO® CARB 3D and 5D Drill Series is now expanded with coolant-through capabilities. 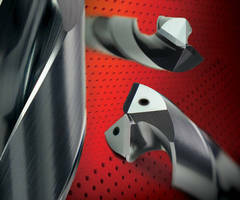 OSG's HY-PRO® CARB 3D and 5D Drill Series is designed for a multitude of materials. Its unique point and flute geometry reduce thrust forces and chip size. Higher feeds and metal removal rates may be achieved with the addition of coolant-through capabilities. The HY-PRO® CARB 3D and 5D Drill Series' applied multi-layered TiAlN coating resists thermo-cracking from heat, thus improving wear resistance over conventional coatings. Lastly, the common DIN shank sizes not only improve rigidity, but also reduce the number of tool holders needed to accommodate them.